Set out on an exciting new quest in this spectacular mix of Match-3, Hidden Object and Adventure. 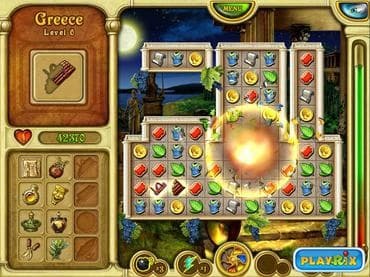 Restore Atlantis to its former glory in Call of Atlantis, an original puzzle game. In this spectacular mix of match-three, hidden object, and adventure games, it's up to you to track down the seven crystals of power and save the legendary continent. Journey through Rome, Greece, Troy, Phoenicia, Babylon, Egypt and Carthage on your quest to remove Poseidon's spells and return Atlantis to peace and prosperity. Featuring unique gameplay, gorgeous graphics, and fun for the whole family, Call of Atlantis is a stirring adventure for puzzle players everywhere. DOwnload free full version game for Mac now and heed the Call of Atlantis today! Free Mac Game Features: - Unique mix of Match-3, Hidden Object and Adventure; - 66 captivating levels with unlimited play; - Superb visual and sound effects; - 7 ancient lands to explore; - Bonus animated screensaver; - Free full version game for Mac. If you have questions about Call of Atlantis game, please contact us using this form.